If you're looking for a great (and cheap!) hotel in Tulum, CheapTickets is the best place to find them. We offer deals on the best 238 hotels throughout Tulum. No matter what you're looking for, we have options for you. Grab great rates on the 146 affordable 3-star hotels that are easy on the wallet without sacrificing comfort. Looking for more luxury? Try one of the 25, 4-star hotel accommodations in Tulum. No matter your budget needs, we've pulled out all the stops to make sure you have plenty of vacation options. Maybe you prefer to search for your hotel deals based on what each hotel offers? For example, let's say you just want to find a hotel or resort that has a pool to cool off in after a long day exploring Tulum. Scroll down to choose from the 39 hotels in Tulum that has a pool for guests. Or search for deals on Tulum hotels offering free wifi or breakfast, non-smoking rooms, and more! CheapTickets is here to be your personal travel agent for your next trip to Tulum. Get booking today! What hotels in Tulum offer free wifi access? Are there deals on Tulum hotels offering free breakfast? Yes! The only thing better than finding a great deal on a cheap hotel in Tulum is finding one that offers free breakfast. Grab some eggs, a waffle, or some healthy oatmeal before a day full of exploring Tulum and all that it has to offer. Below are just some of the many hotels that offer free breakfast in Tulum. 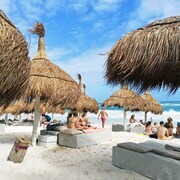 My Way Boutique Hotel - Adults Only is a 3.50 star rated hotel property in Tulum that offers free breakfast. Hotel Posada 06 Tulum - Adults Only is a 3.50 star rated hotel property in Tulum that offers free breakfast. 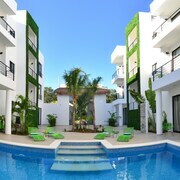 Hip Hotel Tulum is a 3.00 star rated hotel property in Tulum that offers free breakfast. La Posada del Sol is a 3.00 star rated hotel property in Tulum that offers free breakfast. What about deals on pet-friendly hotels in Tulum? Tulum is a great place to get outside and explore with your pets in tow so don't leave your furry friends behind. Below you'll find great deals on hotels in Tulum that allow pets. Don't forget to bring plenty of treats! Don Diego de la Selva is a popular, pet-friendly, 3.00 star hotel in Tulum. Hotel Zulum is a popular, pet-friendly, 3.00 star hotel in Tulum. Diamante K is a popular, pet-friendly, 2.50 star hotel in Tulum. Piedra Escondida is a popular, pet-friendly, 3.00 star hotel in Tulum. Any good rates on Tulum hotels with restaurants? Absolutely. Don't want to deal with planning our all your meals on your trip to Tulum? We don't blame you. Keep the hangry away by staying in one of the 50 hotels that have restaurants. With a room at one of these spots, all it takes to get a good meal is hopping in the elevator. Check out some of the most popular hotels in Tulum that have restaurants below. Book Blue Sky TulumBlue Sky Tulum is a 4.00 star hotel and has one or more restaurant options. Book Intima Resort Tulum - Clothing Optional - Adults OnlyIntima Resort Tulum - Clothing Optional - Adults Only is a 3.00 star hotel and has one or more restaurant options. Book Mezzanine Tulum Colibri Boutique Hotels - Adults onlyMezzanine Tulum Colibri Boutique Hotels - Adults only is a 4.00 star hotel and has one or more restaurant options. Book Casa MalcaCasa Malca is a 4.00 star hotel and has one or more restaurant options. What are the cheapest hotels in Tulum with pools? What's better after a long day exploring Tulum then a relaxing dip in a pool? Finding the Tulum hotel you need for a bargain! Cool off and unwind at one of our 39 Tulum hotels with a pool. Browse some of the top deals on these hotels and resorts with pools in Tulum below, but be warned: You may not want to check out! Hotel Cabanas Los Lirios Tulum has a pool and a 3.50 star rating. Ana y Jose Charming Hotel And Spa has a pool and a 3.50 star rating. Be Tulum Beach & Spa Resort has a pool and a 4.50 star rating. Blue Sky Tulum has a pool and a 4.00 star rating. What hotels in Tulum offer parking for guests? Once you've made your way to Tulum, the last thing you want to deal with is finding parking close to your hotel. Avoid the hassle of parking around the block and carrying your luggage all the way to the lobby by booking one of our hotels with parking. Check out deals on some of the 63 hotels in Tulum that offer parking for guests. Hotel Calaluna Tulum - Adults Oriented This hotel has a 3.00-star rating. La Zebra Colibri Boutique Hotels This hotel has a 4.00-star rating. Blue Sky Tulum This hotel has a 4.00-star rating. Livetulum This hotel has a 4.00-star rating. Do Tulum hotels offer 24-hour concierge services? When you're on vacation, things don't always go according to plan. Travel with peace of mind when you book one of our 48 hotels in Tulum with 24-hour concierge service. That way you know help is always phone call or elevator ride away. Try Kore Tulum Retreat and Spa Resort -Adults Only-All Inclusive. It's a 4.50 star rated hotel in Tulum that offers concierge services 24 hours a day. Try Xscape Tulum. It's a 3.50 star rated hotel in Tulum that offers concierge services 24 hours a day. Try La Zebra Colibri Boutique Hotels. It's a 4.00 star rated hotel in Tulum that offers concierge services 24 hours a day. Try Nomade Tulum. It's a 3.50 star rated hotel in Tulum that offers concierge services 24 hours a day. What about low rates on non-smoking hotels in Tulum? Sanara This hotel has a 3.50-star rating. Coral Tulum This hotel has a 3.50-star rating. Hotel Caleta Tankah This hotel has a 3.00-star rating. 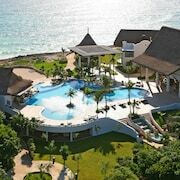 Kore Tulum Retreat and Spa Resort -Adults Only-All Inclusive This hotel has a 4.50-star rating. What are the cheapest Tulum 3-star hotel deals? Our 3-star hotels bring you quality accommodations at a lower price point for the perfect, budget-friendly vacation in Tulum. With 146 3-star hotels throughout Tulum to choose from, you still have options. Browse our selection below. Hotel Cabanas Los Lirios Tulum. 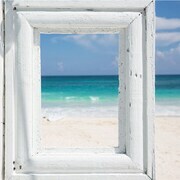 Nestled on the beach, this Tulum resort is within 6 mi (10 km) of Tulum Beach, Tulum National Park, and Tulum Mayan Ruins. Gran Cenote and Tulum Monkey Sanctuary are also within 9 mi (15 km). Hip Hotel Tulum. 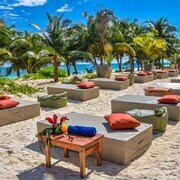 Nestled on the beach, this Tulum hotel is within 6 mi (10 km) of Tulum Beach, Tulum National Park, and Tulum Mayan Ruins. Gran Cenote and Tulum Monkey Sanctuary are also within 9 mi (15 km). Nomade Tulum. Nestled on the beach, this Tulum hotel is 2.4 mi (3.8 km) from Tulum National Park and 2.7 mi (4.4 km) from Tulum Mayan Ruins. Tulum Beach and Gran Cenote are also within 3 mi (5 km). Papaya Playa Project. Located in Tulum, this beachfront hotel is in a national park, 2.6 mi (4.2 km) from Tulum National Park, and 2.9 mi (4.7 km) from Tulum Mayan Ruins. Tulum Beach is 2.9 mi (4.7 km) away. What are the best deals on 4-Star Hotels in Tulum? Tulum is full of hotels and it can be hard to narrow down where you really want to stay. Luckily, we've done that hard work for you be narrowing you from 238 hotels throughout Tulum, to the 25 4-star hotels in Tulum. Our 4-star hotels in Tulum are exactly what you need for your next family trip, romantic weekend, or solo getaway. Check out our most popular deals below. 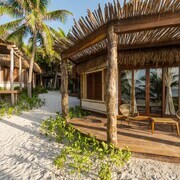 Kore Tulum Retreat and Spa Resort -Adults Only-All Inclusive: Situated on the waterfront, this all-inclusive resort is 2 mi (3.2 km) from Tulum National Park and 2.3 mi (3.7 km) from Tulum Mayan Ruins. Tulum Beach is 2.3 mi (3.7 km) away. Be Tulum Beach & Spa Resort: Nestled on the beach, this Tulum hotel is within 6 mi (10 km) of Tulum Beach, Tulum National Park, and Tulum Mayan Ruins. Gran Cenote and Tulum Monkey Sanctuary are also within 9 mi (15 km). Casa Malca: Nestled on the beach, this Tulum hotel is within 6 mi (10 km) of Tulum Beach, Tulum National Park, and Tulum Mayan Ruins. Gran Cenote and Tulum Monkey Sanctuary are also within 12 mi (20 km). What are the most popular attractions in Tulum? People travel to Tulum from all around to witness the incredible sights and attractions. With 7 sights to see during your stay, you're sure to have a busy trip in Tulum. Below, we've listed some of our favorites. I liked the bed, the room, the roof top...Everything. The only thing that botthered me was workers on the roof top with machinery when I tried to relaxe! The staff was very friendly especially in the check-in and baggage arena. Also the waitstaff at MIA their restaurant. The amenities - although they had massage on the beach at an affordable price- the rooms did not have many perks and were very sparsely furnished. The hot tub in our room took almost 2 hrs to fill because the water press. was not good but the shower was nice! I wanted a little more cush for the price of the room. But I would stay there again. The hotel was very nice and in the center of a lot of things. The only downfall was the AC wasnt the best. It shut off in the middle of the night.